On a famous poster from 1949, Stalin bends over a map of the Soviet Union representing the South-East of the country criss-crossed with gigantic shelterbelts. Dressed in full Generalissimo apparel, smoking the pipe and holding a pen to correct the map, the dictator displays the perspicacious smile of a sage who knows that the future belongs to socialism. „We will defeat drought, too!”, the poster reads. After having crushed the murderous armies of Nazi Germany to the West, Stalin turns now to the East of the country to fight another invader: the dry winds supposedly blowing from the deserts of Central Asia and bringing desolation to the steppes of the Volga region. Indeed, in 1946/1947 hundreds of thousands old and new Soviet citizens had died of famine in the European part of the country. Based on weak scientific foundations deceptively attributed by propagandists to the father of modern soil science, Vasilii Dokuchaev, a governmental decree ordered in October 1948 the plantation of networks of shelterbelts to block off the drought and moisten the climate. This was one of the two main elements of a package, dubbed „Stalin's plan for the transformation of nature” (henceforth „the Plan”), to which hydroelectric cascades and irrigation networks („Stalin's Great Construction Sites”) belonged as well. However, as „In the name of the great work“ convincingly shows, the Plan was not meant to „only” change the climate of the South-East steppe of European Russia: It was a device to propagate those principles and visions of nature transformation promoted by Trofim Lysenko (1898─1976), a crook scientist whom Stalin had made his chief biologist and agronomist. The countries of East Central Europe that had come under Moscow's hegemony in the course of WWII were to become part of the grand project of socialist nature transformation, for nature and society had to be changed together if socialism was to succeed. For the book's editor and one of its co-authors, Doubravka Olšáková, the Plan was not directly imposed by Moscow upon its satellite states. Underlining the agency of national scientists and planners, the authors rather see the Plan as an inspiration for national ways of transforming nature. The Soviet high modernist vision of transforming nature by technology to achieve social progress created a genuine fascination not only with politicians, but with many scientists and would-be scientists in Hungary and Czechoslovakia, and to a lesser extent in Poland. It served certain technocratic groups which had been contemplating large-scale, centrally driven agricultural and industrial transformation already before WWII, and whose ideas were at last rendered possible by the regime change (p. 291). Three chapters form the core of the book, each handling a country of East-Central Europe under Soviet ascendancy: Doubravka Olšáková and Arnošt Štanzel write on Czechoslovakia, Zsuzsanna Borvendég and Mária Palasik on Hungary, and Beata Wysokińska on Poland. An introduction by environmental historian Paul Josephson and a conclusion by the editor frame the country studies, which share a common topic catalog: after introducing the reader to the national specificities of „Sovietization”, the authors go over to show how the traditional scientific institutions were brutally reshuffled and reorganized to fit a Soviet model of centralized and top-down structuration of research, that of the Soviet Academies of Sciences. Central are the reception and adaptation of the Plan in the three countries: the acclimatization of new species to develop mainly industrial crops, the planting of forested belts to protect fields, the construction of hydraulic works to develop irrigation, transportation and energy production, the introduction of the travopol'e system of crop rotation devised by Soviet soil scientist Vasilii Vil'iams (1863─1939) and absolutized by Lysenko. Furthermore, the chapters handle the propaganda of Lysenkoist theories and changes in landscapes including urbanization. Disparate measures, bunched together without any meaningful coherence, imposed regardless of the local environmental circumstances, could only fail. And indeed, the Plan mainly failed in Central Europe as it failed in the Soviet Union: citruses did not grow in Hungary, rice in Poland, cotton in Czechoslovakia. Indeed, most measures never left the experimental farms: Central European communists managed to escape most of the criminal absurdities of the Soviet situation where travopol'e was forced for a short time upon steppe regions where no grass could grow and where unnecessary, gigantic shelterbelts were planted at great cost only to die within a year or two. Here the authors are very clear that the gap between propaganda and reality could not be wider. Unlike in the Soviet Union, the atrocities of forced labor were mainly avoided. Hungary was the exception: Experiments with developing cotton the Soviet way went so far that schoolchildren had to be marshaled to the fields (pp. 155, 158). Rice cultivation in the Hortobágy Puszta resorted to the labor of deportees (p. 173). The Plan and its propaganda were not a total failure, though, as the blossoming of the Michurinist movement in all three countries shows: if none of them had waited for plant breeder Ivan Michurin (1855─1935) to develop a rich horticulturist tradition, the idea that everyone could participate in creating collectively new plant varieties provoked positive and lasting engagements. Lysenko enjoyed less respect, and could not exert the kind of power he had in the Soviet Union. If it was difficult or impossible to publish a direct criticism of his false theories in genetics and agronomy in Central Europe, undercover criticism was the rule. The case of travopol'e is telling: nowhere was it implemented on significant areas. It was clear that the food situation did not allow for grassing down a large percentage of the land, given the great development of industrial crops. After 1953, Lysenko disappeared quickly from the Central European radar and did not enjoy there the comeback Khrushchev granted him at the turn of the 1950s─1960s in the USSR. The editor stresses the issue of continuity: like in the USSR, most reservoir and agriculture development schemes, as well as conservation ideas, went back to the 19th century. Their implementation had been interrupted by the war. This circumstance allowed the Communist rulers to present the new regime as the only able land planners. It helped furthermore to „nationalize” the Plan. However, an important continuity to test would be with the war and occupation period, from 1939 to 1945. The cultivation of Kok-saghyz, or Russian dandelion, was a German as well as a Soviet obsession. The fascination with this plant which could replace natural rubber in the military industry, is the fruit of a Nazi-Stalinist circulation, a story to which the Hungarian case could add some interesting aspects (pp. 160–161). Another link to test would be with the deadly „General Plan Ost” and its avatars, which foresaw a complete reorganization of territory and decimation of population in the countries occupied by Nazi Germany. Beside this suggestion, a few critical remarks are in order. First, the role of Soviet experts in exporting the Plan remains mysterious. In the Hungarian case several of them are mentioned as being either interventionist, or reluctant to dictate the Hungarians what they had to do (pp. 159, 164). But a systematic study is needed. Second, the book lacks maps, especially a map showing the natural and human setting in the three neighboring countries to locate cities, rivers and biomes. Last, it is unfortunate that the book parallels the three national monographs without sustained effort to cross the national boundaries, although the topic of „Sovietization” and the question of how the COMECON economic coordination intersects with the Plan are conducive of such a transnational approach. Notwithstanding these shortcomings, the book makes a valuable contribution to the understudied environmental history of Central and Eastern Europe. It calls for further, more integrated transnational and comparative studies of ecological problems and environmentalism in the region. P. Piskunov, I zasukhu pobedim! [Poster], Iskusstvo 1949. Susanne Heim, Plant Breeding and Agrarian Research in Kaiser-Wilhelm-Institutes 1933─1945. Calories, Caoutchouc, Careers, New York 2008. Marc Elie: Rezension zu: Olšáková, Doubravka (Hrsg. ): In the Name of the Great Work. 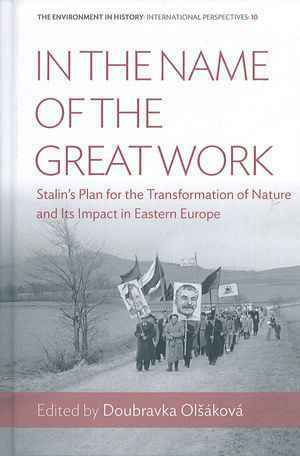 Stalin's Plan for the Transformation of Nature and its Impact in Eastern Europe. New York 2016 , in: H-Soz-Kult, 15.04.2019, <www.hsozkult.de/publicationreview/id/rezbuecher-28706>.